The Philippines summer is about to end. Our seasons in this part of the world is not exactly the same as the seasons in other countries in the Northern hemisphere. Our summers start and end earlier (March to May). It is then followed by the monsoon season (June to November). Then we go to the cool dry season of December, January and February. You will notice that almost half of the year, we experience rainy season - which is good for the forests but not really good when you are trying to plan your outfit. So one might say that it's best to stick to dark colors so as not to easily spot the mud speckles that are associated with walking in the rain. Since today is the last day of May - I decided to end it with a bang and I wore my brightly colored skinny pants and matched it with brightly colored shirt. 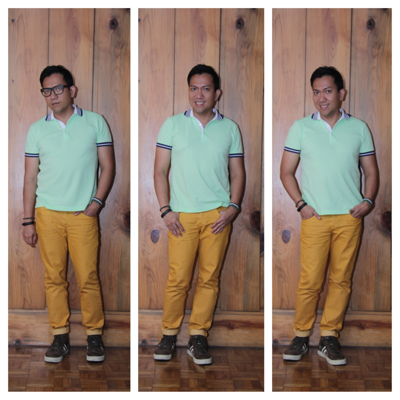 The pants are from Bench - they really did a good job of coming up with ready to wear jeans that fit me well. The shirt is from Collezione. Next month - I will have to start wearing my raincoat. Hmmm maybe I should get a bright red raincoat. What do you think?